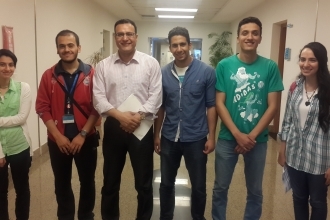 For the second time in a row, University of Science and Technology students achieved the first place in the Science Operations Leaders in Egypt (SOLE) competition which took place September 12, 2015 at the Faculty of Agriculture, Ain Shams University. Salah Obayya to Receive Senior Doctor of Science Degree from Reputable University in U.K. Professor Salah Obayya, vice chairman, academic affairs, at Zewail City of Science and Technology, has been chosen to receive the Senior Doctor of Science degree by City University London, U.K. during the university’s convocation ceremony in January 2016. 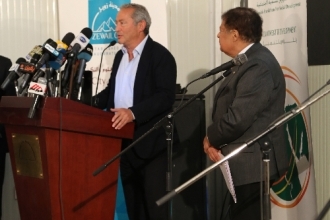 Professor Sherif El-Khamisy, director of the Center for Genomics at Zewail City of Science and Technology, won the 2014 Abdul Hameed Shoman Award for Arab Researchers in medical and health sciences. The award recognizes the valuable research work El-Khamisy has conducted in the field of upscale molecular genetics. 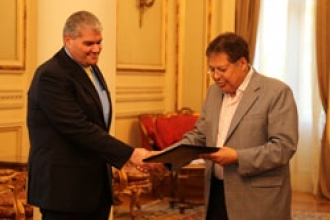 Prof. Ahmed Zewail awarded tenureship positions to three faculty members for the first time in the history of Zewail City of Science and Technology, on Tuesday, August 11, 2015. 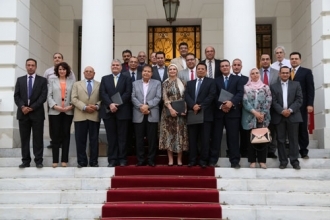 In a large ceremony held at the Zewail City of Science and Technology’s headquarters in Garden City, Dr. Ahmed Zewail, Chairman of the Supreme Advisory Board, awarded 12 full scholarships. 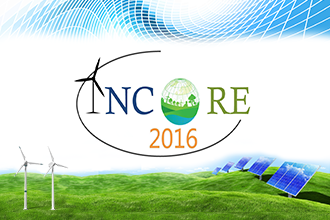 Zewail City of Science and Technology and the African Network for Solar Energy (ANSOLE) are organizing the International Conference on Renewable Energy(INCORE 2016). 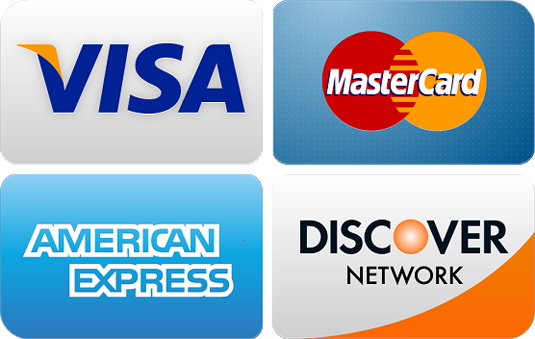 We are pleased to announce that the deadline to receive the admission application has been extended to August 2, 2015. On July 7, 2015 Google announced the 90 regional finalists who will be competing in its 2015 science fair. 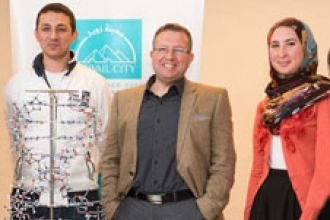 University of Science and Technology freshmen, Lamis El-Sayed and Mahmoud Habashy, together with Osama Elsayed, Mansoura University student at the time of the competition, were named among these 90 regional finalists. 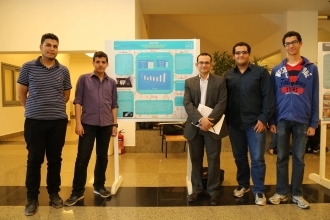 As part of the University of Science and Technology’s vision to promote for real life application of science, second year students presented their analytical chemistry course projects in a poster session on Sunday, March 29, 2015. Driven by the resolution to solve one of the ecological problems the Egyptian society faces, second year University of Science and Technology students - Islam genina, Lobna Wael, Amr Magdy, Nouran Bahgat, and Mahmoud Abdelhay - have managed to find a solution for groundwater contamination in Bahria Oasis. Prof. Salah Obayya, director general of research institutes, has been appointed to be the vice chair for academic affairs effective April 1, 2015. 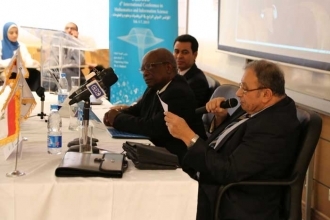 Zewail City of Science and Technology hosted the 4th International Conference in Mathematics and Information Science (ICMIS) on Thursday, February 5, 2015 in collaboration with IEEE Zewail City, the African Academy of Sciences, and the Egyptian Mathematical Society. A new study, conducted by researchers at the Center for Fundamental Physics, has been highlighted by Nature Middle East.